Zimbabwe took part in ICC World Cup Qualifier 2018 as one of the ten participants. They successfully passed the group round and qualified for the playoff. In Super Six round, they failed to show charming performance and in the 3rd match which was their last match in playoff, they faced defeat against United Arab Emirates. As a result of the match, Zimbabwe ruled out from qualifier round. So, now they could not get chance to play the main event of upcoming ICC World Cup 2019 which will be hosted at England and Wales. Zimbabwe played three matches totally in playoff round where their opponent were Ireland, West Indies and United Arab Emirates. They won the inaugural match there against Ireland but rest two matches against West Indies and UAE, they faced defeat. So, they faced the certain disappointment in the tournament. Zimbabwe played the group stage match where they were placed into group B. Thy finished group stage matches by standing on the top position and they hoped to qualify for the main event of ICC World Cup 2019. But all hopes were lost. On the other hand, United Arab Emirates is a newbie team which was placed into group A and finished the group stage competition standing on 3rd position. However, they played their playoff matches against group B qualified teams. They also played three matches against Scotland, Afghanistan and Zimbabwe but won only once against Zimbabwe in their last match. If we consider the last match between Zimbabwe and United Arab Emirates, Zimbabwe came to chase the runs and went too close to the victory. They would win the match but applying D/L method, Zimbabwe unfortunately lost the match by only 3 runs so far. 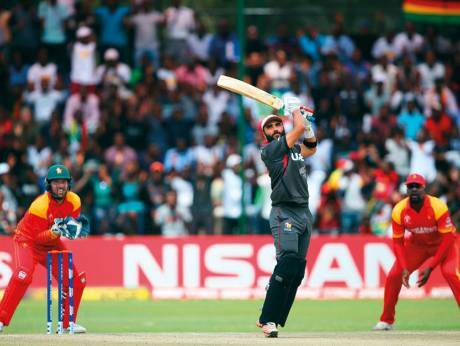 In 22nd March, 2018 the match between Zimbabwe and UAE took place at Harare Sports Club, Harare. In the match Zimbabwe won the toss and let UAE to bat first. SO, United Arab Emirates came to open the match and played 47.5 overs. They did not lose all wickets but rain affected the match. They scored total 235 runs by losing seven wickets. Due to rain their innings finished in 47.5 overs. Rameez Shahzad scored highest 59 runs in 61 balls. Sikandar Raza took highest three wickets for Zimbabwe. Later, Zimbabwe faced a revised target which is 230 runs in 40 overs. But they finished their innings successfully and scored 226 runs. They also lost seven wickets where Sean Williams scored 80 runs highest for the team. Naveed took three wickets for UAE. So, Zimbabwe faced defeat by 3 runs only.